Spring sale results provide promising upturn as Irish art market shows signs of recovery. 'Blue Still Life' by William Scott – €450,000 (£391,300) at Whyte's. The Irish art market continues its recovery but at a more measured pace than the boom years defined by the Celtic Tiger a decade ago. This was the consensus offered up by the Dublin auction houses that sold Irish art at the end of May. Between Whyte’s and Adam’s (both 20% buyer’s premium), €2.6m (£2.2m) worth of mainly 20th century Irish art sold, with lofty selling rates of 75% (Whyte’s) and 89% (Adam’s) from just under 350 lots. De Veres (19.5% buyer’s premium) also offered a small section of Irish art in its May Design sale, which achieved similarly high selling rates on the back of its main Irish sale in April. This was optimistic reading for a sector that had declined so dramatically following the severe economic downturn that began in 2008, and the six or so years of lethargy that followed. Yet, as the Irish economy undergoes its recovery, a revival dubbed the ‘Celtic Phoenix’ (rising from the ashes of the Celtic Tiger era), those in the market are cautious not to repeat the cycle. “Everyone is trying to dampen things down a bit. We don’t want the same thing to happen again,” said Ian Whyte, managing director of Whyte’s. Whyte’s opposite number at Adam’s, James O’Halloran, offered a similar opinion. “When people start paying way over the odds for things, that’s when you start to feel concerned. But I certainly don’t have that concern at the moment,” he said. Adam’s sale totalled €900,000 (£782,600), which was “in keeping” with the auction house’s previous results since the market improved, though slightly better than predicted given the “extra bounce” from a higher than expected selling rate. Like the sales held in March, Northern Irish dealers and collectors were noticeably absent at both auction houses. The poor sterling exchange rate, uncertainly over the direction of Brexit negotiations and the general election have kept purse strings tight north of the border. Those who did take part – mainly Irish, British and American buyers – were prepared to bid strongly for quality works by established artists with good provenance. Both sales centred on two single-owner collections, which achieved a number of the top prices. Adams featured 50 lots of 20th century Irish art from the collection of one of Ireland’s most famous businesswomen, Gillian Bowler (1952-2016). The collection amassed over several decades by the Budget Travel founder totalled around €400,000 (£347,800), attracting plenty of bids and new clients. At Whyte’s, more lots were offered from the large personal collection of the formidable Northern Irish dealer George McClelland and his wife Maura. The auction house has been selling off 20th century works, spread across at least four of McClelland’s properties, over the past year or so, with the total so far around the €2m mark. 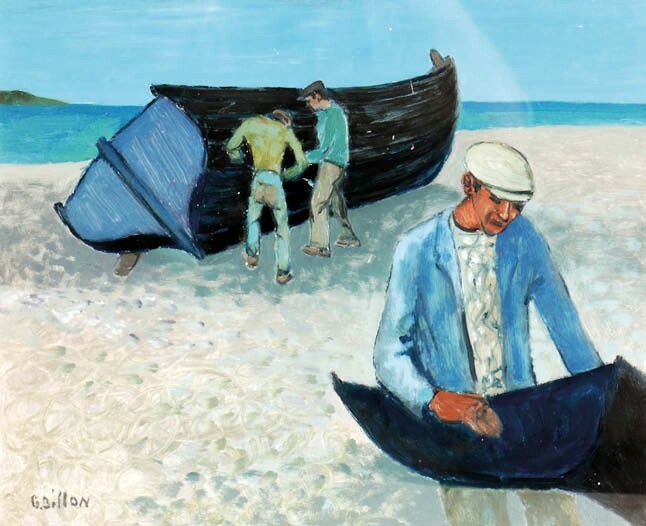 'Men and Boats, Connemara' by Gerard Dillon – €36,000 (£31,300) at Whyte's. The most expensive lot across the sales, and making up over a quarter of the Whyte’s total on May 29, was William Scott’s (1913-89) vast Blue Still Life (1969-70). 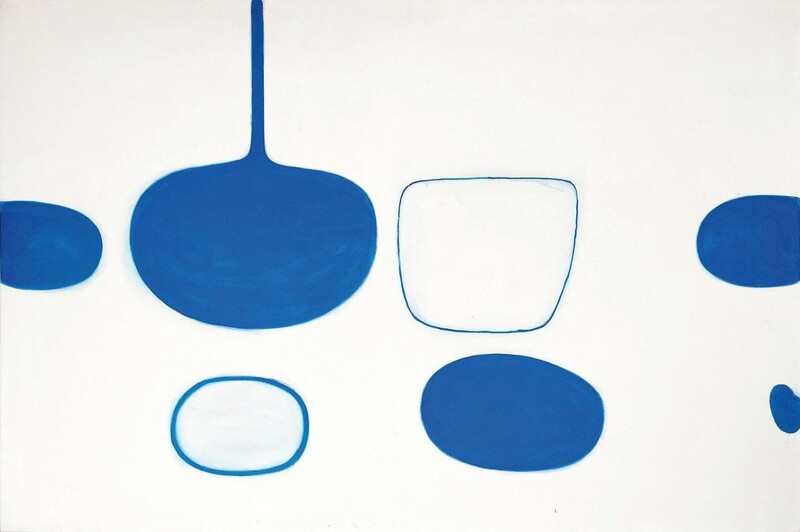 One of the works from the McClelland collection, the 4ft x 6ft (1.21 x 1.82m) oil on canvas belongs to the highly lucrative Mediterranean blue and white canvases the artist produced in the 1970s. It had last sold at Christie’s in November 2007 to the Richard Green gallery in London at £390,000. In Dublin, it sold at €450,000 (£391,300) to an English private buyer against a €400,000-600,000 guide. Prices for the artist have lifted in the last few years. In April, de Veres sold a much smaller square blue and white work from 1973 for a multi-estimate €140,000. “There seems to be a great resurgence of the artists from the 1950s and ‘60s, Scott among them, but I think this area is still massively undervalued,” said Whyte’s managing director Ian Whyte, who added that he would not be surprised if the same picture sold in a few years’ time for over €1m. While a premium exists for his blue and white canvases, Scott’s still-lifes from the 1950s still pack the biggest financial punch. According to the Art Sales Index, Scott’s record at auction is £920,000 (£1.07m with premium), fetched at Christie’s in June 2008 for Bowls Eggs and Lemons (1950), a double-sided oil on canvas. 'Adam and Eve in the Garden' by Louis Le Brocquy – €140,000 (£121,700) at Whyte's. Another McClelland highlight was an exceptionally well-preserved and imposing 4ft 7in x 9ft (1.39 x 2.75m) tapestry by Louis Le Brocquy (1916-2012). 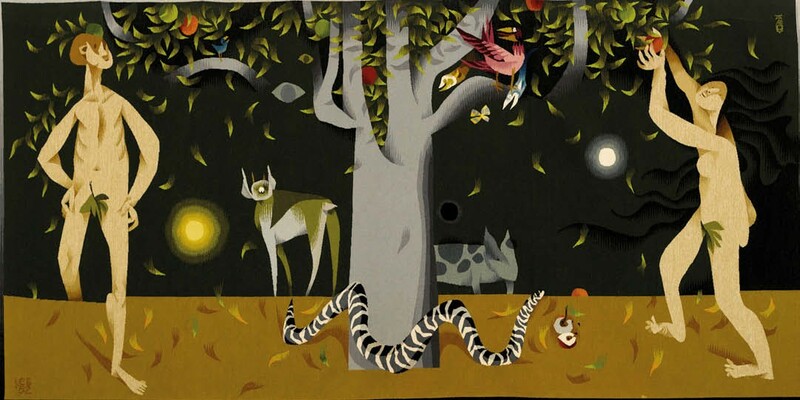 Adam and Eve in the Garden (1951-52) was one of an edition of nine made in collaboration with Tabard Frères & Soeurs, the French textile firm founded in Aubusson during the 17th century. It was eagerly contested, soaring to €140,000 (£121,700) against a €80,000-120,000 guide. This was double the amount a faded example from the same series had sold for at Whyte’s in 2012. A market-fresh oil on board by Gerard Dillon (1916-71), descended through the family of Tadhg Crowley, a box office manager with The Abbey Theatre in Dublin during the 1960s-’70s, sold for double its estimate at €36,000 (£31,300). Men and Boats, Connemara, a 12½ x 15in (31 x 38cm) oil on board, is typical of Dillon’s portrayals of rural and folk life on Connemara and the Aran Islands in western Ireland. Affordable highlights included a postcard-sized oil of the affluent Dublin suburb Dalkey by Harry Kernoff (1900-74), which sold for nearly three times its top guide at €5600 (£4800). A single-owner group included a quartet of illustrations by the British-born Irish actor, dramatist, writer and impresario, Mícheál MacLiammóir (1899-1978). It was led by his cover design for the 1956 Scéalaíocht na Ríthe (Stories of the Kings), a book of early Irish hero-tales, which sold for €5200 (£4500) against a €400-600 estimate.